Last week we were invited to a Media Day event for Disney’s new Toy Story Land at Hollywood Studios. We had so much fun!! We met family members who had come in from Indiana and were staying at one of the nearby Disney Resorts. The kids and I had never been to Hollywood Studios, so we were amazed at how easy it was to get from the parking lots to the main entrance. Disney with toddlers is always a challenge, but I was prepared and they were so excited!! 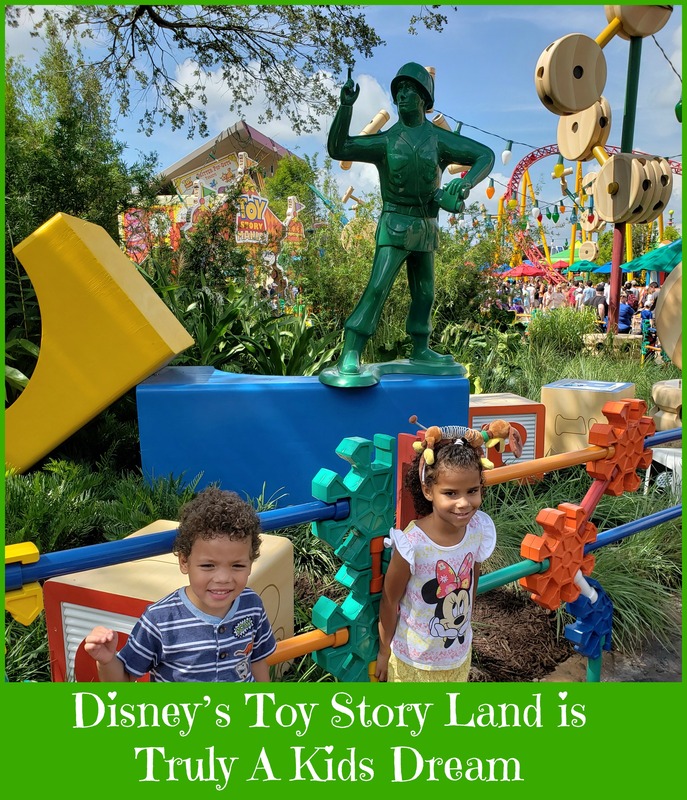 Upon arriving, we given a wonderful swag bag full of goodies including a Slinky Dog headband and plush Mickey Mouse and headed off to Toy Story Land. Immediately upon entering Toy Story Land, guests are greeted with the sights and sounds Andy’s toys. The first ride that you come to is Slinky Dog Dash. This super fun roller coaster takes you on a toy filled ride as Slinky Dog takes you through hills, curves, and drops. Alien Swirling Saucers reminds me of Mad Tea Party but with a cosmic spin. Toy Story Mania! allows guests to ride ‘n’ blast moving targets at this midway-style, 4D shootin’ game starring popular characters. While we were there, we enjoyed a delicious lunch at Woody’s Lunchbox. Woody’s Lunchbox is pretty much smack dab in the middle of Toy Story Land and offers outdoor dining with a view. As we were dining, we enjoyed watching the green army patrol (they walk on parade every hour) as well as the throngs of people enjoying Toy Story Land. Another great thing about Toy Story Land, is that guests have the opportunity to meet their favorite characters. From Woody and Jessie to Buzz Lightyear. Unfortunately, our day was cut short by severe thunderstorms and torrential downpours, but we had a blast nonetheless. I can’t wait to go back again and experience even more of Toy Story Land at Hollywood Studios.